Space is "becoming a contested war-fighting domain," Defense Secretary Jim Mattis said Thursday. "We have to adapt to that reality." Critics, even those who agree with the strategic significance of space, argue that creating a Space Force is "an unnecessary and expensive bureaucratic endeavor," as Reuters put it. Trump announced his plan for the Space Force in June. As NPR noted at the time, " a new branch of the military can only be established by an act of Congress — something that hasn't happened since the Air Force was split from the Army in 1947. 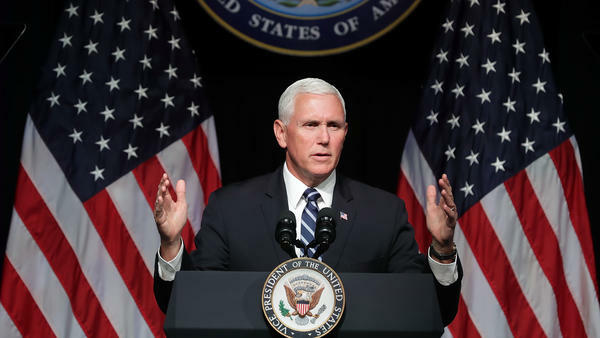 But the Department of Defense has identified "five actions that can be taken immediately to begin building the Space Force," according to a fact sheet released by the White House on Thursday. They include establishing civilian oversight for the Space Force and creating a United States Space Command to "improve, evolve and plan space war-fighting." But if you have visions of joining the military — now or under a future Space Force — and strapping on a jet pack, NPR's Geoff Brumfiel is here to crush your dreams. "The U.S. military is big in space, but it's all unmanned satellites," Brumfiel reports. Those satellites handle intelligence and surveillance, as well as command, control and communication, among other things. Joan Johnson-Freese, a space security expert at the Naval War College, told Brumfiel that she doesn't think a Space Force is currently necessary. "Why do we have a Navy? We have a Navy to protect shipping lanes," she said. "Until we have those same needs in space, the Air Force and the other services are doing all the things we need to do." Brian Weeden, a former Air Force officer who worked in space operations, tells Brumfiel that he agrees there are potential threats in space. He also says that the current system, with the Air Force in charge of military space operations, is not ideal. But he, too, isn't convinced that a Space Force is the answer. He worries that creating an all-new branch will just create more bureaucracy, Brumfiel reports.